On target: Brian Reape of Mayo scores will be happy with his outing last Saturday night. Photo: Sportsfile. Mayo's losing streak at MacHale Park finally came to an end last Saturday night as James Horan's charges accounted for Roscommon in round one of the NFL - by the slimmest of margins - winning out on a scoreline of 1-08 to 1-07. Ironically Mayo's last win at home in league or championship, was also against the Rossies, when Stephen Rochford's team beat them by 1-19 to 0-14 in round two of the league played in late February 2017. It's hard to believe we had gone almost two full years without a home win. Kerry, Dublin, Tyrone Galway and Monaghan had all visited and left with the spoils in that time. A tally of 10,941 hardy souls braved the monsoon rain and squally, often hurricane like wind for the opening game of the 2019 league, a testament to how well our county teams are supported. The conditions were up there with the worst you could experience for supporters and especially the players where the most basic skills were extremely difficult to execute. 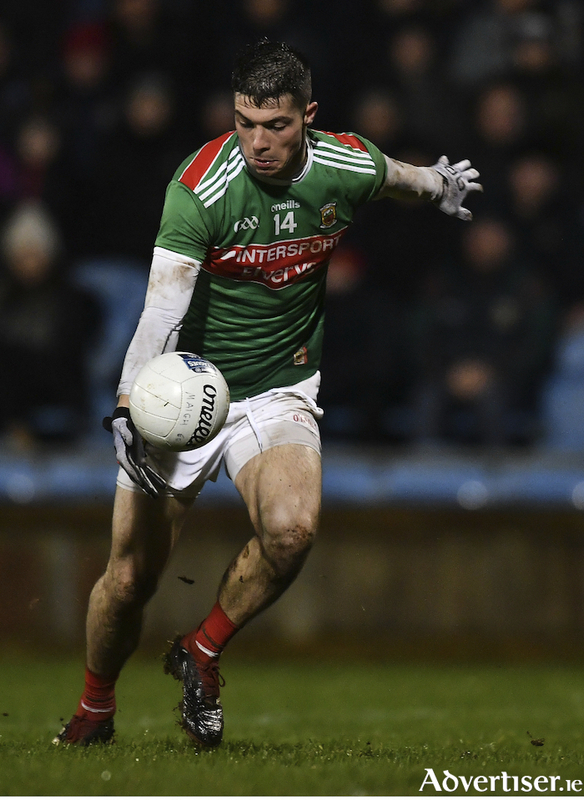 Mayo clung on in the first half, playing into the teeth of the breeze. All they had to show for the first 35 minutes was a point from a placed ball from Evan Regan. Regan's execution from the hands was top drawer as he judged the wind to perfection, but it left me slightly bewildered why he chose to kick another free from the ground later on in the half, which he failed to even raise off the grass. All matters considered, it's impossible and unfair to be critical of any player considering the atrocious conditions. Kick-out strategies went out the window, from Robbie Hennelly's restarts the O'Neill’s was dragged up to 40 metres off course by the swirling gale. Mayo can be thankful for Hennelly's agility however, in the 14th minute of the first half a looping effort from Cathal Cregg looked to have him beaten, only for an outstretched hand from Mayo's custodian to brilliantly tap the ball over the bar. Hennelly's blushes were somewhat saved just before the half time whistle as a gust caused him to lose possession of the ball as he carried across his own square. A little more composure from Roscommon and they could have had a morale boosting goal just before the break - the unflattering 0-5 to 0-1 scoreline testament to the apocalyptic like conditions. Things got so bad Eir Sport had to move their cameras off the roof of the media tower and to a safer environment nearer the pitch. The second half will mostly be remembered for two instances. The first, a superbly finished goal from débutante Brian Reape, that lifted the Mayo faithful. Kevin Mcloughlin must have been giving tips to Reape on how to deceive the officials as he clearly over-carried the ball before his bullet effort almost tore the back of the Roscommon net. Roscommon keeper Darren O'Malley didn't even move, such was the venom in the shot. The second and most controversial incident came after a coming together between Donie Smith and Keith Higgins. I personally didn't see it in real time and had to rely on the Roscommon supporters around me for clarification on what happened. They were baying for blood and wanted Higgins reprimanded as Shine rolled around on the ground as if he had been picked off by a sniper. The clash caused a very unnecessary pushing and shoving contest that involved up to 20 players. Replay footage has since proven that Smith placed his hand in an aggressive manner to the eye area of Higgins. It doesn't look good for Smith when viewed in slow motion. Higgins was fully entitled to react the way he did. I don't know Donie Smith personally but I'll presume he regrets his actions. Let him take his punishment and everyone get on with it. I don't agree on this trial by social media lark that seems to have crept into our game. Conor Diskin will be relatively satisfied with his début, he worked really hard without threatening the scoreboard, while Brian Reape has showed us he has a real eye for goal. Judgement has to be reserved on both until we see them against better opposition and in more favourable conditions. Last Saturday's game will do their confidence no harm whatsoever, Tyrone in Omagh will be a different prospect. Tyrone's loss in Kerry last weekend will have them hell-bent on redemption and desperate for a result when Mayo travel to Tyrone next Sunday. This encounter will be more indicative of where we are at. Tyrone humiliated us in Castlebar in the league last year in what was arguably our worst performance of the year. We seem to do better against them in Omagh. The bookmakers fancy Mickey Harte and co and have them installed as 1/2 favourites. Mayo are 2/1. I'd settle for a draw in Omagh any day of the week. The odds on that are 17/2 if you're wondering.